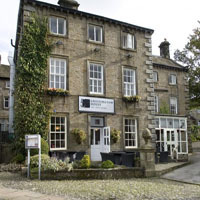 Enjoy the beauty of the Yorkshire Dales at the award-winning Grassington House Hotel, nestled among the limestone hills of Wharfedale and overlooking the picturesque cobbled square of Grassington. Original Georgian architecture is complemented by rooms we have sumptuously refurbished with modern facilities to offer luxury along with the comforts of home. Grassington House was first converted into a hotel in the early 1900s, and the beautiful course squared, brown-grey limestone structure has remained an impressive feature of the village square ever since. We have freshened up the interior of the hotel to preserve and celebrate the elegance of its Georgian beauty while adding a contemporary twist with luxurious modern fixtures and fittings. Dine with us in our elegant restaurant No. 5 The Square. Our mouth-watering dishes are prepared entirely in-house by our dedicated chefs, using the best fresh local produce twinned with international speciality ingredients. We offer traditional favourites with a contemporary twist and seasonal dishes served with imagination, including our own hand-reared rare breed pork. All year round we offer a program of special events for visitors and locals to enjoy. We support Grassington events, and host a few of our own…. Revel in the warmth of our Yorkshire Dales welcome with John’s award-winning food, relaxing surroundings and luxurious bedrooms. We’ve a program of special offers, events and entertainment to offer, whether you’re a visitor or a local. Join us for a delicious lunch or dinner or stay longer with one of our short break special offers. Licenced for Civil Ceremonies, we invite you to get married with us here in the luxury of Grassington House or join us for your intimate wedding reception following a local church wedding. We promise you fabulous food, sumptuous surroundings and attentive service for a perfect day with lasting memories. Relax knowing that Grassington House is exclusively dedicated to your private wedding party. Choose from our beautifully dressed conservatory or restaurant for your romantic civil marriage ceremony, entertaining up to 46 seated guests for your wedding breakfast or 60 for a buffet. Our wedding menus are carefully prepared by our award winning chef John Rudden and his team, featuring perfect dishes prepared using only the best fresh, local produce. For a larger wedding party, we’ll bring the luxury of Grassington House to your marquee or village hall, from five course menus to luxury hog-roasts. “Every event is tailored to suit you and our venue is perfect for all sorts of functions from christenings to funerals, corporate or social club events and exclusive wedding parties which can hire out the entire hotel. Enjoy an entertaining morning watching John Rudden, Grassington House’s own master chef showing you how to create some of his favourite dishes. With fresh coffee on arrival and a delicious three-course lunch afterwards, it’s gourmet heaven! Our masterclasses are now a major fixtrure on the grassington house events calendar and are very popular, so please book early to avoid disappointment.